Good morning! 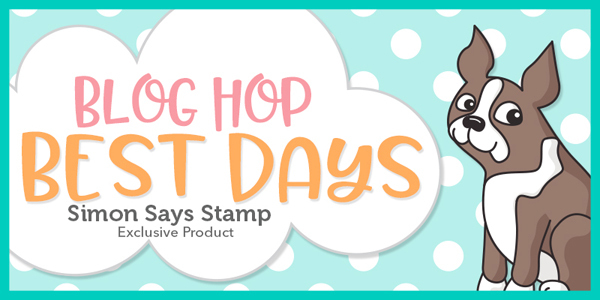 I’m super excited to be a stop on the hop for the Simon Says Stamp Best Days Release blog hop!! I’ve already shared a couple of cards using the new release here (along with a personal giveaway) 😉 and I’m sharing another pair of cards today! I created a video for my two cards today that you can watch below or in HD at my YouTube channel here! I was very inspired by a recent video from Kelly Latevola where she shares how to use copic coloring over distress oxides and I decided to try a similar technique using distress inks. This was WAY out of my comfort zone but I’m so glad I gave it a try because I really had fun creating it! I started by smooshing distress inks onto a piece of watercolor paper. After I finished smooshing I stamped the images from Even More Spring Flowers onto the panel and heat-embossed them with detail black embossing powder. Then I added shading using copic markers slightly darker than the distress inks. I finished the card with a sentiment from CZ Design’s Emphatic set, a little bit of spectrum noir clear sparkle, and a few drops of nuvo crystal glaze! 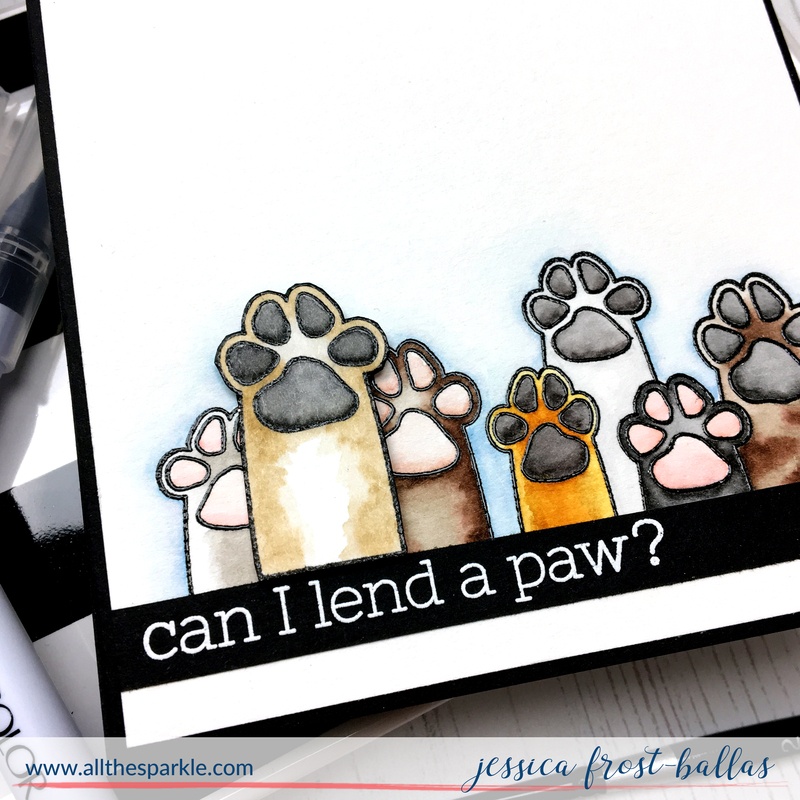 My second card uses the same distress ink color palette but in a MUCH softer way! For my second card I used masking to stamp and heat-emboss the flowers across the bottom of the panel. Then I used a light wash of distress inks to create an ombre pattern from the bottom of the panel up. 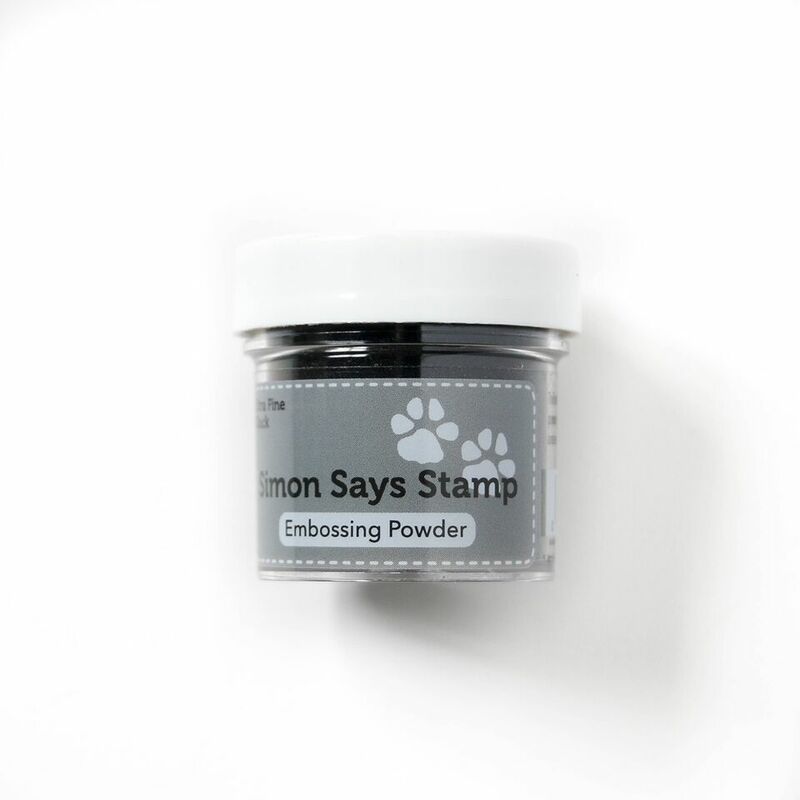 I combined sentiments from Emphatic and Big Thanks Words and stamped them with versamark before heat-embossing them with detail black embossing powder. Finally I added more shimmer with my spectrum noir clear sparkle brush and a few nuvo crystal glaze drops! Something new to try. Thank you! I loved your bright colors bursting from the flowers! love the look that these techniques deliver! Beautiful cards. Both cards are beautiful! The one I like best is the second one with the lightest colors. stunning cards! I think you’ve found a new comfort zone! Beautiful techniques and gorgeous colors. I’m loving all the new SSS releases! Your first card is absolutely stunning with its choice of colour. It is what I call a “dynamic” card. Love it. Wow! So many techniques in those cards and they turned out soooooo beautifully! Such an inspiration! Your cards are so pretty, thank you for sharing your video!! I love the splatter effect!! Gorgeous, gorgeous cards! Love that splash of colors from the distress oxides and the ombré technique. This kit is awesome! Love, love, love your cards and the colors you used!!!!!! 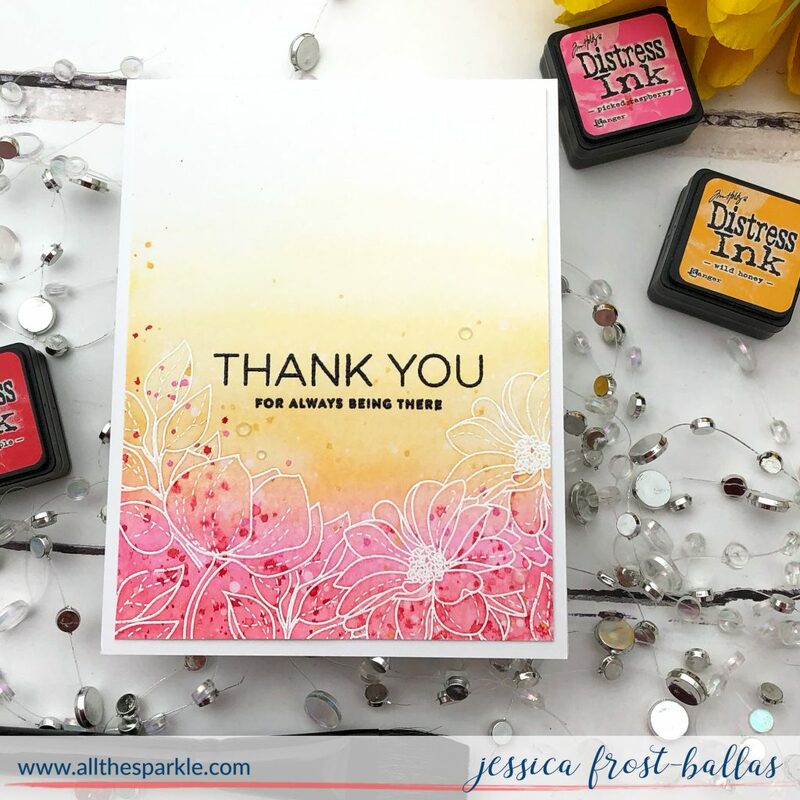 Happy colors – happy cards. Once again you proved that we can create so much with one single stamp set. Thanks. 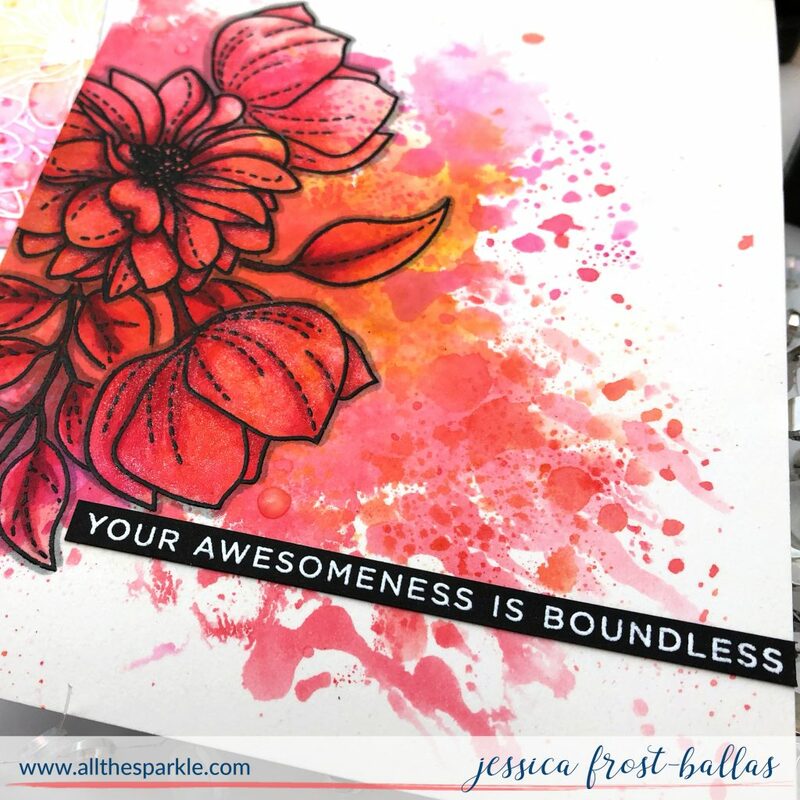 two wonderful cards, Jess – each lovely in their own way! already watched your video and it is so inspiring! definitely going to try this out as I’m quickly becoming a technique junkie! You’ve inspired me on my alcohol backgrounds so this is no surprise you’re inspiring me with the distress inks! 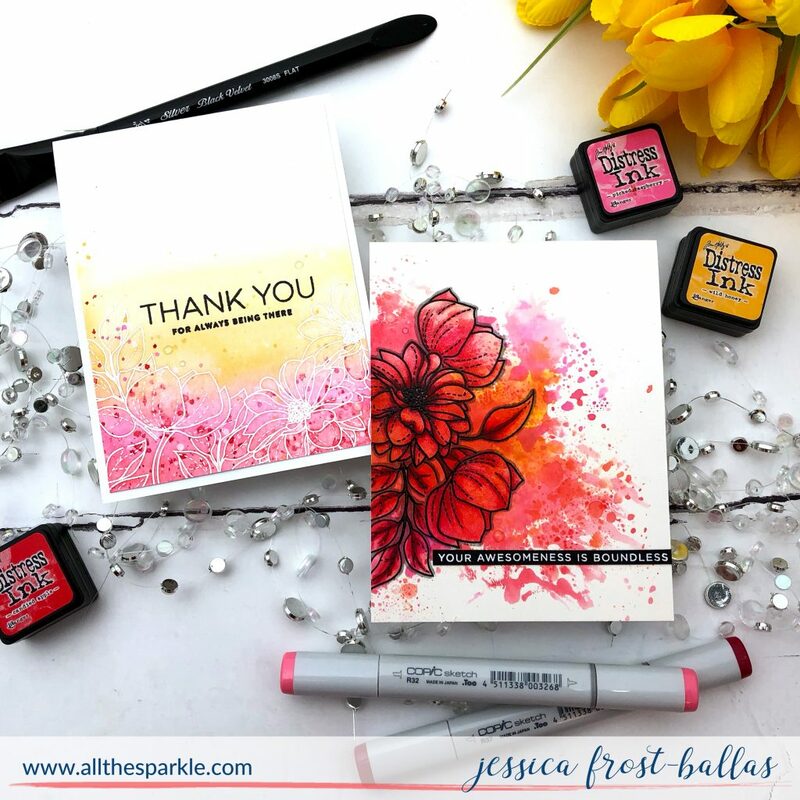 These are beautiful and the new spring flowers stamps are gorgeous. 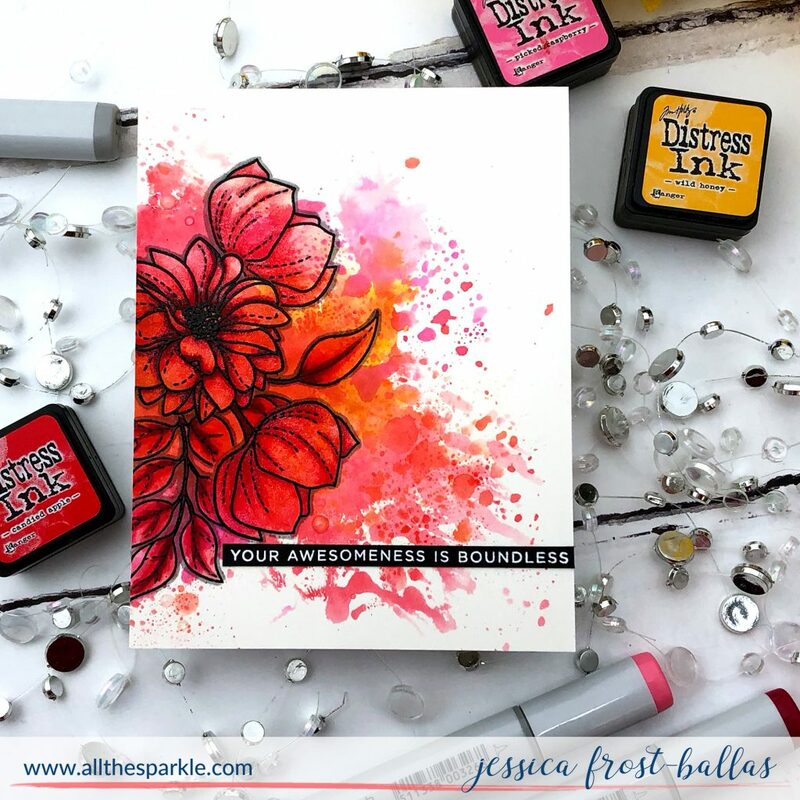 I love the way you can get 2 different looks just by using the Distress inks in different ways, that’s so cool! Thanks for sharing such pretty cards. I just love the stamp set you used. WOW! The first card packs a punch in the colouring. Could you maybe look at doing something similar with zig water markers. Just bought a pack and keen to use them for a similar card. Thanks for sharing the ombre technique with watercolour. Very pretty! 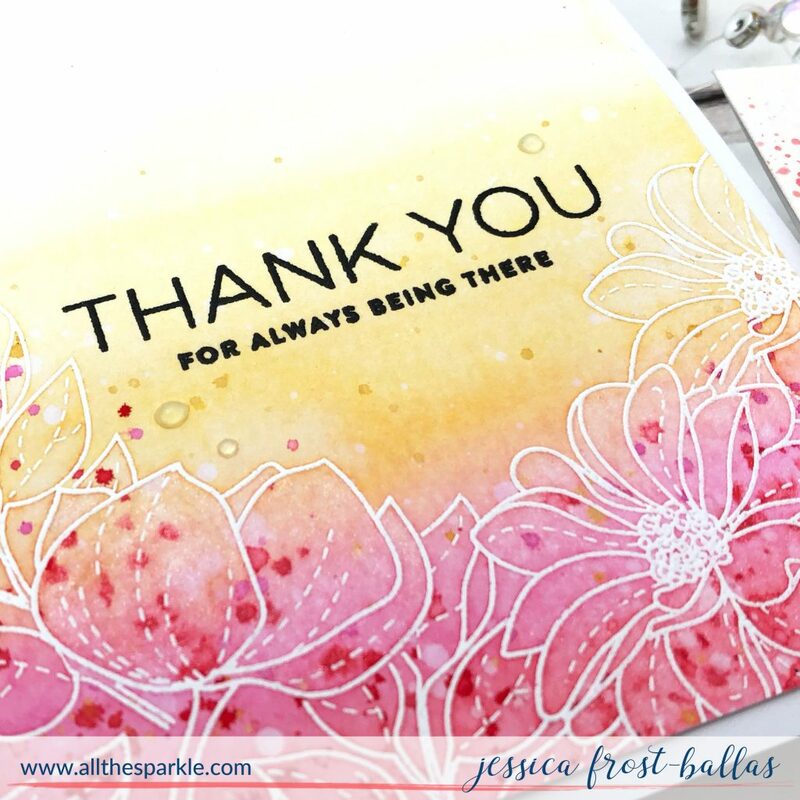 Wow your cards are stunning Jessica, love how you use colour so very pretty.